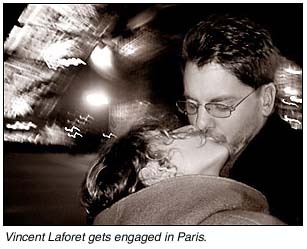 Frequent Sports Shooter contributor Vince Laforet proposed to girlfriend Amber in picturesque Paris last month. Larfort tells Sports Shooter that the couple are planning a January wedding in Hawaii. "Needless to say I'm on cloud nine right now!" Vince said. Rich Clarkson & Associates will hold it's annual Digital Summit June 23 - 28 in Vail, CO and follow that up with the Sports Photography Workshop July 1 - 6 in Colorado Springs. "A faculty of the nation's top photographers from varying realms and specialties will spend a week in the summer of 2002, with a limited number of other top-level professionals photographing in the heart of the Colorado Rocky Mountains using Nikon D1 digital camera," states the Clarkson & Associates web site. On the 15th annual Sports Photography Workshop, the web site describes " the workshop provides an opportunity to listen to, study with, consult and network with those very individuals who are uniquely positioned to help your development and career. Included in the instructional sessions will be lectures on remote camera installations, large arena lighting, portraiture of athletes and the business of freelance sports photo GRAPHY." Tuition for the Digital Summit is $1,200 and the Sports Photography Workshop is set at $800. The Clarkson & Associates web site notes that space is limited for both events. City Gallery in the Historic Water Tower, 806 N. Michigan Avenue, will display color photographs by the official photographers of the Chicago White Sox and the Chicago Cubs, Ron Vesely and Stephen Green, from April 11 through July 9. The exhibition, For the Love of the Game, shows baseball culture - the fans and the parks of both teams. The photos capture impromptu moments inside and outside the parks, from the lone fan standing wistfully in front of the closed ticket windows at Wrigley Field, to several children tagging a base at Comiskey Park. Ron Vesely has been photographing sports for over 17 years, having covered nine World Series and eleven Super Bowls. His work has been published in magazines such as Sports Illustrated, Sport Magazine, Inside Sports Magazine, USA Today and Forbes, among others. His relationship with the Chicago White Sox began in 1985 as one of their contributing photographers and evolved into his present position as the official team photographer. Stephen Green has been the Cubs' team photographer for 19 years, photographer for the Oprah Winfrey Show for five, and has been published in various newspapers and magazines, including Sports Illustrated, Time Magazine and Newsweek. He has also published two fine art books of documentary photography. Long-time Arizona Republic staffer Paul Gero has left the paper and moved to Southern California with his new bride Nikki. "My last day at the Republic was March 22 after almost twelve years there, "Gero tells Sports Shooter, "Time sure flies. "My wife Nicki and I got married in October and we both wanted to start our married life together in a place that was new for both of us. Plus Nicki's from Cape Town, South Africa and was missing the sea ...she feels quite at home in Manhattan Beach. I'm enjoying it as well! We're about a 1/2 mile from the pier, so it's very nice ... quite a change from the climate of Phoenix." Gero will be freelancing and getting into the documentary wedding photography business. "Photojournalists might cringe at the thought of 'doing weddings'. But I've found that I really enjoy covering them and it's a perfect market that appreciates storytelling photography," Gero said. While in Phoenix he had been shooting assignments for publications like People, Sports Illustrated and USNews & World Report. You can look at Paul's work and contact his through his web site at: http://www.paulfgero.com/.